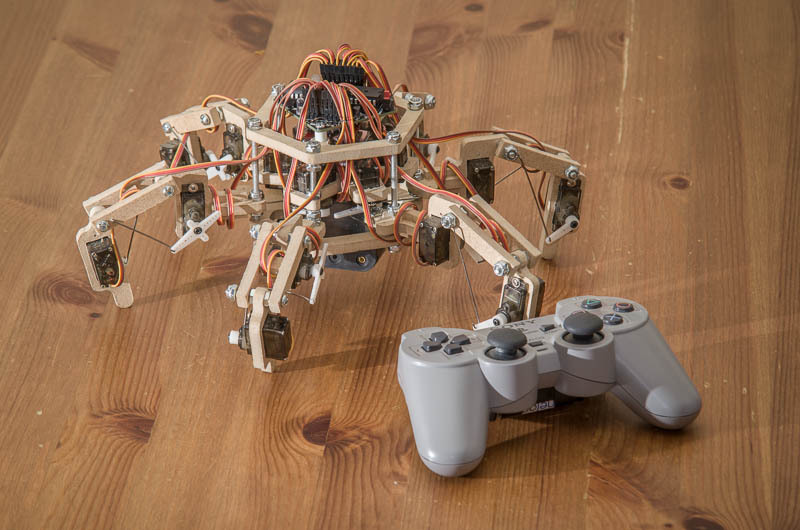 Stubby is an evolving hexapod robot which I am making, with contributions from my 6 year old daughter (design, frame manufacture) and a co-worker (code review, debugging). 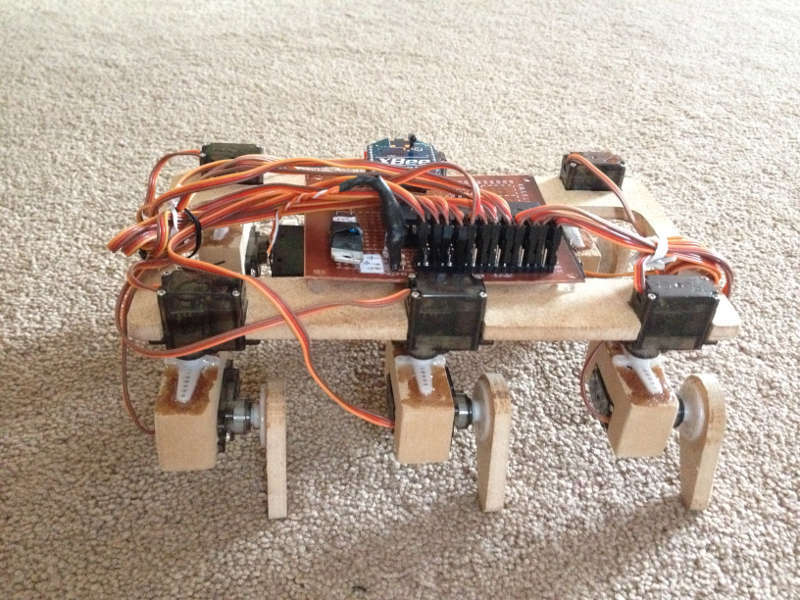 I have long wanted to make a walking robot, thanks to shows like Stargate SG-1 (yay replicators!). While Stubby is not the same (6 legs vs. 4 legs, no wings, and of course there is the small part about not being able to turn raw materials into copies of itself... yet...), it has been a very entertaining and educational project to work on. Stubby originated as a 2-DOF (12 servo) direct drive model which was supported directly by the servos (greatly limiting the size, weight, and shape). 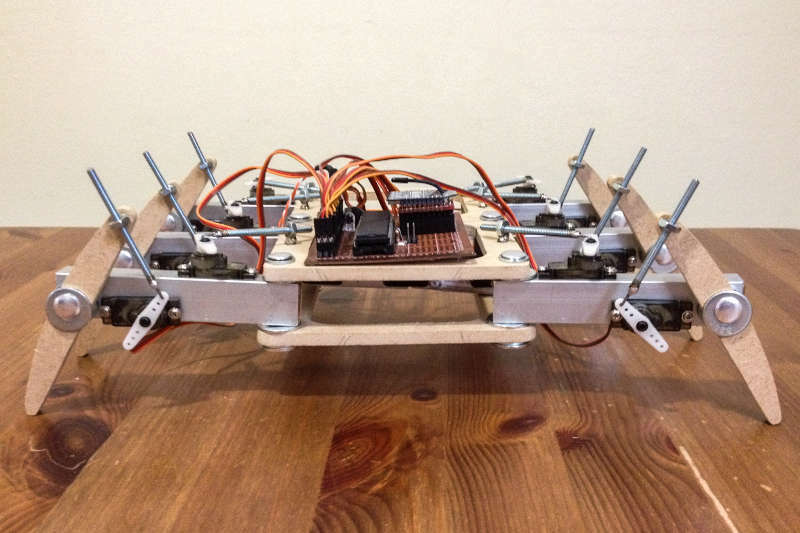 After quickly discovering the limitations of this approach, we changed it to use mechanical joints activated by push rods connected to the servos. The current version has a 3-DOF frame with radial symmetry and a full inverese kinematics engine. To keep the build costs down, Stubby uses cheap RC servos ($2 each from Hobby King). The special frame design allows these cheap servos to work by using mechanical advantage to increase the output torque at the expense of travel distance. The frame is constructed of 1/4" MDF, which can be cut with a scroll saw. The plans for the frame fit entirely on an 8.5x11" sheet of paper. Currently the robot is controlled by my Universal Controller, a PS2 controller which has been modified with an XBee. This video demonstrates the different abilities of Stubby version 3, thanks to its inverse kinematics engine and 3 DoF legs. Stubby is licensed under a Creative Commons Attribution-Share Alike License.